Storefront Academy South Bronx is a public charter school that opened in Fall 2015. Our school provides children of varied academic strengths quality educational opportunities, preparing them academically, socially, and emotionally to become critical thinkers, high-achieving students, and well-rounded individuals. If you need assistance or have questions, please contact the Storefront Academy Development Office at (212) 427-7900, ext. 223. 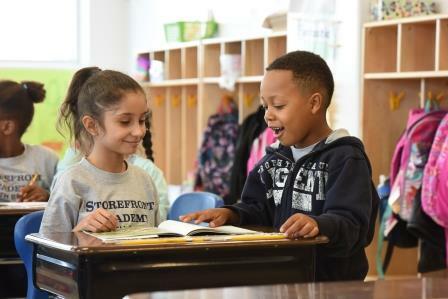 Donate 100% - Add 3% so that 100% of the donation goes to Storefront Academy South Bronx. Storefront Academy South Bronx has partnered with Network for Good to securely process your online credit card payment via Network for Good (tax ID 68-0480736). This transaction will appear on your credit card statement as "Network for Good." This transaction is subject to Network for Good’s Privacy, Security & Disclosure Statement and the Charitable Solicitation Disclosure.